Delcam is to hold four meetings for users of its ArtCAM artistic CADCAM software across North America in October. The meetings will be in Toronto, Ontario, on Tuesday October 4th, in Orlando, Florida, on Friday October 7th, in Grapevine, Texas, on Saturday October 15th and in Santa Monica, California, on Thursday October 20th. Each meeting will be a full day packed with a combination of new features and techniques, tips and tricks, and business benefits. "We are confident that by attending one of the ArtCAM User Groups, users will enhance their skill and knowledge in ArtCAM, so they can produce their work with greater speed, efficiency, accuracy and cost effectiveness, gaining maximum return on their investment,” he continued. "I’m really enthusiastic about this year’s ArtCAM User Groups,” said Mr. Plunkett. "We have some exciting new things to show in ArtCAM.” These include a number of new options for higher quality results, in particular, "contour blend” that can improve the quality of text, enhanced texture effects, especially those that intersect or overlap, and aid in producing complex borders on items like picture frames. Another significant improvement is in the quality of vectors generated directly from bitmaps imported from 2D drawing packages such as Corel Draw, or scanned from artwork or photographs. With earlier versions of ArtCAM, it could take some time to clean up the vectors but the new release gives much better results that require minimal editing. Once vectors have been created, it has been made much easier to edit them into exactly the shape that is required. The node editing tools have been enhanced with the ability to move points and automatically produce smooth curves around the shape or to maintain any sharp angles. In addition, mid-points can be displayed automatically on any curve to simplify the creation of more complex geometry. The range of standard clip-art supplied with ArtCAM has been extended with 130 extra reliefs, including architectural, floral, frame and texture examples. 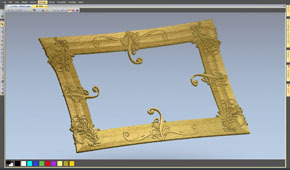 For more information on the new features in ArtCAM 2011 release, go to www.artcam.com.